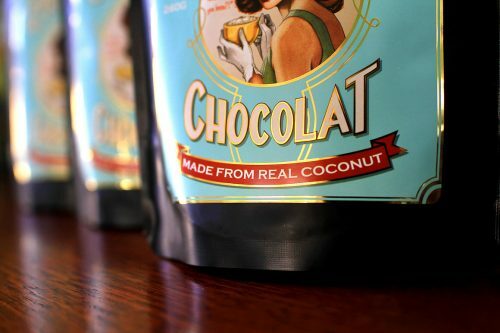 Expertly hand-crafted with a blend of 40% premium coconut milk and 25% specialty European cocoas, Chocolat is rich, smooth and decidedly delicious. The chocolate flavour is surprisingly dominating to satiate even the most serious of cocoa cravings, while the healthy coconut oils (from one entire coconut per bag) add an amazing level of body and creaminess. A hint of spice and our organic unrefined sugars, retaining all their naturally occurring trace minerals, add an extra dimension of flavour. And if that’s not enough, it also contains around 30% less sugar than your standard fare of hot chocolates, making it a truly decadent yet wholesome drinking chocolate. After tasting Chocolat, it will certainly be hard to accept anything less!